I think we can all agree that sewing isn’t always the most cost efficient hobby. Sometimes it’s really expensive especially when we are trying to be eco friendly or use quality fibers in our fabrics. To be honest, patterns are not that cheap either. The projects that we make as sewers involve a lot of thought, time, and financial resources to make really great pieces. There are a lot of people who find great deals on fabrics at their local thrift stores! However, I am one of those people who haven’t had as great luck finding fabrics there. Some other ways that I save on cost is by using free PDF patterns! There are SO many great options out there! My heart is to always be supporting small businesses, and I still buy quite a few indie patterns, but there are times when it’s not working with my budget for the month. I’m sure I’m not the only one, so I’ve compiled a list of all my favorite FREE sewing patterns! A lot of local libraries will let you print up to 75-100 pages a day and/or week. It’s just up to your local library – so go check them out to see what you could start printing there! I adore this pattern. I have plans to make a dozen more right now! It a great everyday dress that is super easy for beginners. You will learn how to make darts, add a zipper, and gather! It’s a beautiful feminine silhouette. This pattern is the everyday basic that you NEED. And I think the word “need” is even an understatement for how much this works in your wardrobe. I’ve made 3 different versions of this pattern already and I guarantee there will be more. I will probably say this about every single pattern, but this is PERFECTION. Peppermint magazine has a desire to help you learn brand new things and enhance your skills with each piece of clothing that you make. I’ve made this particular blouse four different times and have loved each one more than the last. This one is very similar to the Mandy Boat Tee, but the cowl collar is perfect for the cold days. I’ve made this top 3 times and wear it on a weekly basis! Click here for my previous blog post about it! This pattern is so fun because it teaches you how to draft it yourself!! I was able to make this in a total of 45min and have made a bunch for friends! It’s a quick and easy ADORABLE make that will kick-start your sew-jo! I think this has the cutest shape! I can’t wait to make this for the summer in a lovely cotton law, linen, or double gauze. I’m dreaming of all the colors. Well don’t these look like the most wonderful sailor style pant you’ve ever seen. I’m dying to make a black pair in corduroy or tencel. I’m currently undecided. I think this pattern speaks for itself. I’ve seen a lot of people wear it un-belted giving it a very casual and easy-to-wear look. I think this would be a great top for when I’m at the gym because of the cutout back! 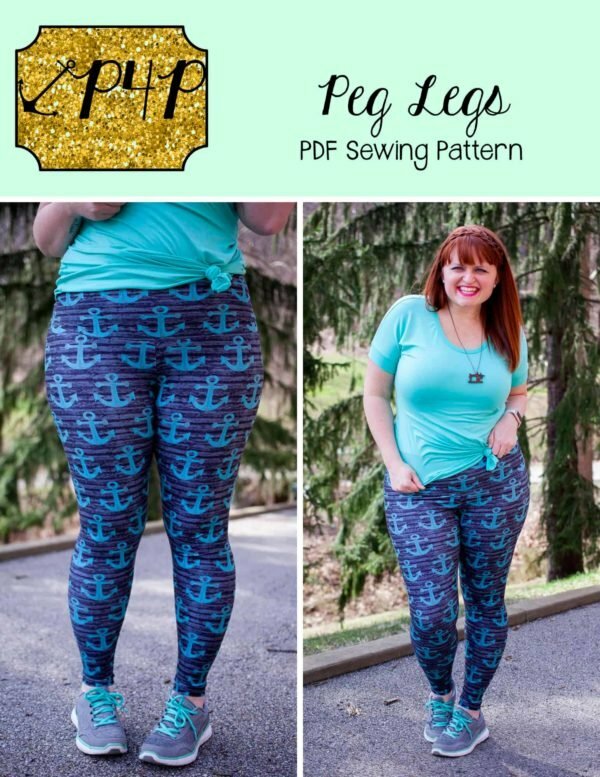 This is a GREAT legging pattern with awesome add-ons! It has a high-waisted option, side paneling, pockets, and SO much more! This skirt is the perfect go-to for summer and I want to make it in all the colors! This looks like another perfect basic tee that I need for layering! This is the cutest bag to make for my purse and make-up! I plan to make dozens. Her tutorial is by far the BEST I have ever read. It is so detailed and easy to follow that anyone could do it! I’m a 23-year-old-event-planning-Jesus-loving-self-taught-sewist. I married my wonderful husband in July of 2016 and we love living in Springfield, MO. My other hobbies consist of floral arrangements, hiking, reading, and dreaming of Colorado.